Georges Jouve was born in Fontenay-sous-Bois, France in 1910. He began his formal training in design and sculpture first at the École Boulle, and then later at the Académie de la Grande Chaumière. After graduating in 1930, Jouve worked as a stage designer. Jouve was a drafted into the army in 1939. After a battle, Jouve was taken prisoner by the Nazis and interred in a German camp. After several unsuccessful escape attempts, Jouve fled to his parent’s home in Drôme in the South of France. It was in this town that Jouve began to learn the medium of ceramics, to which he applied his knowledge of sculptural forms. 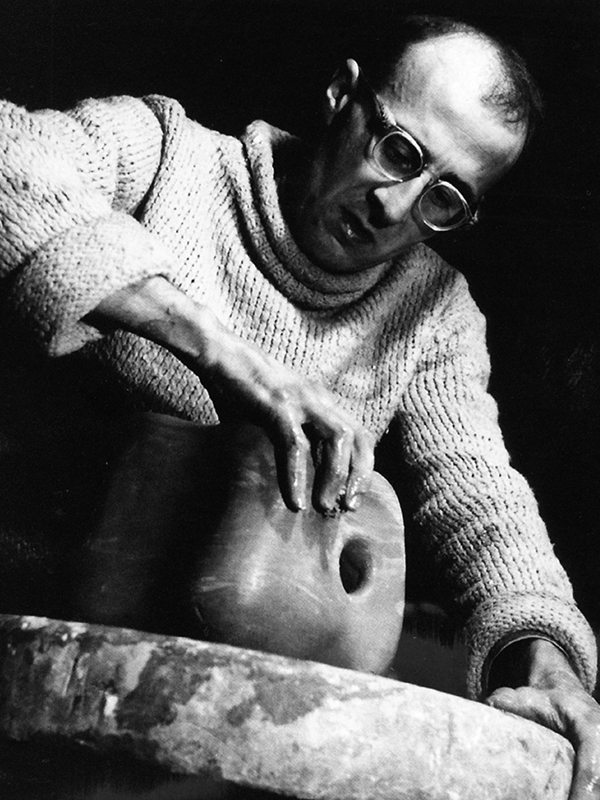 In 1945, Jouve moved to Paris, and he opened an atelier for ceramics on the rue de la Tombe-Issoire. Jouve’s modernist ceramics caught the eye of famed designer Jacques Adnet, who invited him to exhibit his work at the La Ceramique Contemporaine show with the Compagnie des Arts. With the support of Adnet, Jouve began to exhibit regularly at design salons like the Salon de l’Imagerie and the Salon des Artistes Décorateurs. The French Ministry of Higher Education asked Jouve to exhibit his ceramics worldwide, and his works were shown in Rio in 1946, Helsinki in 1948, and Rome in 1950. Jouve passed away in 1964, but he left behind a groundbreaking legacy of biomorphic ceramics that redefined craft with their sculptural forms.